Visitors coming to Branson will always have the chance to catch plenty of fish in the Tri-Lakes area, but they can also hook plenty of fresh seafood at some sushi restaurants in Branson. Whether you eat your sushi with chopsticks or fork, be it raw or deep fried, Branson has several sushi restaurants for you to enjoy during your vacation. These sushi restaurants in Branson that offer mouth watering sushis include Wakyoto Japanese Steak and Sushi, Mitsu Neko Fusion Cuisine and Sushi Bar, Sushi House, and Shogun Japanese Steakhouse. Wakyoto Japanese Steak and Sushi is one of the best sushi restaurants in Branson that offer conservative Japanese fair such as the basic California roll, the deep-fried version Branson Roll, and exotic tastes of yellow-fin tuna. Located on West 76 Country Blvd., this sushi restaurant was formerly known as Wasabi Japanese Steak and Sushi and was voted best sushi in town by TripAdvisor users. The sushi served in this restaurant is incredible and the crab tempera is phenomenal. Their specialty rolls such as Wakyoto roll, Amazing Lobster Roll, Tuna Lover roll and Triple Spicy roll all taste delicious. The Japanese cuisine can be enjoyed also at West 76 Blvd. in Branson with the unique twist of Mitsu Neko Fusion Cuisine and Sushi Bar. Using the freshest ingredients, this sushi restaurant mixes delicious melodies of tastes and colors that are sure to delight every diner’s appetite. With their unique preparation on Sushi food, you are sure to enjoy the perfect dish that you are looking for. At Mitsu Neko Fusion Cuisine and Sushi Bar, you will experience a truly unique taste of sushi that will make you decide to return again and again. 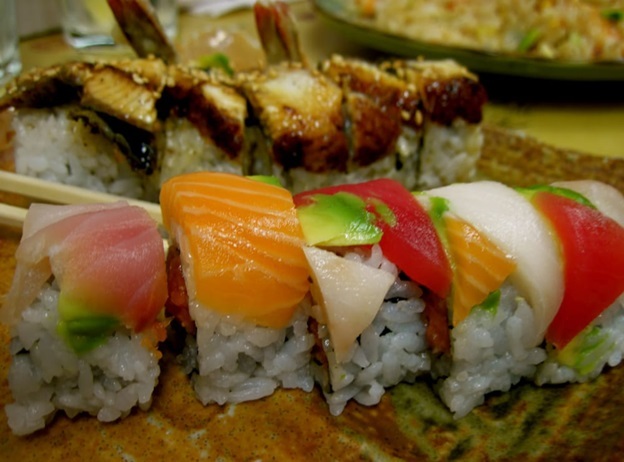 If you are a lover of sushi food on a budget, you will love the Japanese cuisine at Branson’s Sushi House, also located on West 76 Country Boulevard. The menu in this sushi restaurant includes a variety of signature rolls that feature ingredients including crab, tuna, salmon and eel for less than$6 each. If you’ve built up an appetite, you will love the sushi-bar entrees which include 10 or more pieces of sushi, as well as miso soup, for as little as $12. Shogun Japanese Steakhouse is another beautiful sushi restaurant in Branson that offers an array of favorite sushi selections. This steakhouse features fine Japanese dining, as well as gratifying hibachi cuisine. Shogun Japanese Steakhouse also offers a menu full of nigari, rolls, cuisine and cocktails that are sure to please even the most picky diner. Guests in this Japanese restaurant sit family style around the Hibachi grill while the chef slices, dices, and entertains while preparing dishes for the entire group. This steakhouse also offers dining away from the Hibachi grill at the sushi bar where guests can watch the Sushi Chef prepare your favorite choice of dish. Whether you eat your sushi raw or deep fried, you are sure to enjoy mouth watering sushis at some of the best sushi restaurants in Branson.